As the immediate pressures of the migration and refugee crisis in Europe have begun to abate, policymakers have refocused their energies on two goals: anticipating and preventing the next crisis and ensuring that newcomers—and the communities in which they settle—have the tools to thrive. These two objectives are deeply interdependent. Getting it right with these new arrivals is the linchpin on which all future asylum and immigration policies will be built, as this Transatlantic Council Statement explains. Over the next five years, governments and humanitarian actors will be judged by their ability to transition from the provision of short-term, emergency care to the creation of long-term opportunities. This will entail getting refugees into work and their children into school—and ensuring both have the chance to succeed, wherever they are. But the path to the successful achievement of integration objectives is not always a clear one. Policymakers must navigate increasingly complex public sentiments, colored by what is now deep skepticism and even anger about the prioritization of the needs of newcomers at the expense of other investments—real or perceived. 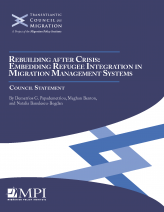 This Council Statement analyzes how best to support positive integration outcomes among refugees while not undermining the integrity of asylum and migration systems—that is, the ability of governments to design and implement systems based on rules and consistent principles; retain control over arrival numbers and procedures; and communicate the choices and tradeoffs inherent in these systems to their publics.